Great Wall Hanging for Walking Dead Party or Halloween Costume Party Gathering! *Note: This item cannot ship to P.O. Box. Please provide a physical address. 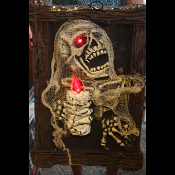 Detailed Zombie Skeleton Grim Reaper Picture with LED Flickering Light Bulb in Candle and Eyes! 3D Light-up Zombie Portrait is a great addition to your Halloween decorations or party. Prisoner #666 has been jailed for centuries and has used his time to plan his escape. Sculptured with a candle and eyes that flicker, it gives your home or haunt the spooky atmosphere that you have been searching for at an affordable price. Buy several to adorn your hallway or the entry to your dungeon. Approx measurements: 24-inch (60cm) High x 16-inch (40cm) Wide x 1-1/2-inch (3.75cm) thick.